Organization, apparently an Israeli branch of 'Jews for Jesus,' targeting Jews in new leafleting campaign. 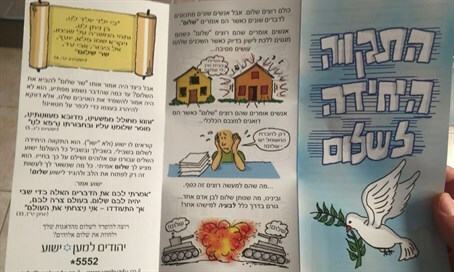 Thousands of missionary leaflets were recently distributed to mailboxes across Petah Tikva, the Yad L'Achim anti-missionary organization noted Tuesday - and it warned residents to be vigilant against the attempts to lure them to Christianity. "Missionaries expend a lot of energy to convert Jews specifically to the Christian religion, and consider this a special achievement," says Rabbi Shmuel Lifshitz, a leader of the organization. "The missionary system in the country based mainly on major Christian sects such as Messianic Jewry, Jews for Jesus, and others." The organization reminded that the motive behind the missionary activity is a religious ideological motive. "The missionaries consider introducing as many new people to their faith their mission in life," Lifshitz noted, adding that they believe that the more Jews convert, the closer Jesus's Second Coming is to fulfillment. "An activity carried out of ideological fervor and for a good cause, so to speak, is that more dangerous." Yad L'Achim made it clear that they consider saving the Jewish people from Christianity their ultimate goal and that is the main reason that they battle missionary organizations and their members. "In the case in Petah Tikva, this is a matter of a fundamentalist missionary cult - Messianic Jews - who do all they can to convert Jews to Christianity under the guise of Jewish concepts." "Unfortunately, even 68 years after the establishment of Israel, there are those who act to sabotage the law prohibiting the distribution of material from missionary sects and therefore missionary activities are problematic but not illegal," he added. Rav Lifshtiz reminded the public to contact Yad L'Achim about any missionary sightings.